To find the perimeter of a shape, take all of the outside measurements and add them together. There are only 2 measurements showing. However, perimeter goes all the way around the square which has four equal sides. Therefore, the measurement of the other sides must be the same and must be used to find the perimeter. If the area of a square is 100 cm2 then what is the length of each side? What is the perimeter of the square? What is the perimeter of a square that has a side with a length of 12 cm.? To find the perimeter of a shape, you must add up the lengths of the sides. By definition, a square has 4 equal sides. So, you only need to know the length of one side of a square in order to know the lengths of all the sides of a square. Since the length of one side of this square is 12 cm., you can either add the lengths of the four sides together or multiply the length of one side by 4. The units used in this answer would be cm. — not cm.2 — because we are only find the length aroud the shape when solving for perimeter. The area of a square is . What is the perimeter? The area of a square is given by . Here , so take the square root of both sides to get . The area of a square is given by , or . Take the square root of both sides to get . The perimeter of a square is given by . Substitute the side length obtained from the area equation to get . Use the square to answer the question. 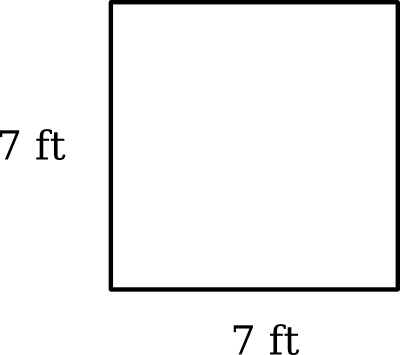 What is perimeter of the square? What is the length of one of its sides? Since divided by equals , then is the length of one side of the square. You can also check your answer by adding up the lengths of all the sides or by multiplying the length of one of the sides by . If you get , you are correct. The area of a square is . What is its perimeter? The area of a square is calculated by multiplying one side by itself. If the area is 25, then the length of one side will be the square root of 25. The square root of 25 is 5, so each side must be 5 feet long. If each of the four sides is 5 feet long, then the perimeter would be 20 feet because there are four sides total. Colorado College, Bachelor in Arts, Psychology.